People pray at the entrance to Heng Chia Shrine during the Mid-Autumn Festival in Bangkok's Chinatown. I went down to Chinatown to see if anyone was getting ready for the Vegetarian Festival, a nine day celebration of vegetarian food and Chinese culture. The festival starts around October 1 this year, so I was a little early. On my walk back to my subway stop I saw a large crowd at Heng Chia Shrine and I stopped to photograph. Inside Heng Chia Shrine. It's a tiny place, smaller than the average suburban living room in an American home. 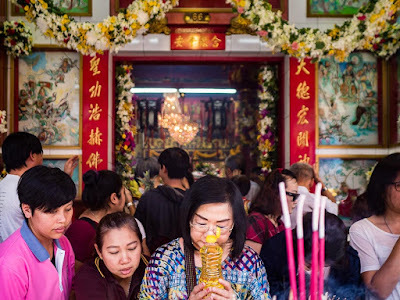 Heng Chia Shrine is an interesting place. It's on one of the main streets in Bangkok's Chinatown. It's not just small - it's tiny and there is hardly any room to move around inside. There's a permanent haze and the smell of burning incense is thick in the air. I've passed by it countless times and it's almost always busy. Frequently busier than the much larger and better known temples in the neighborhood. Earlier today, for the Mid-Autumn festival, it was jammed. 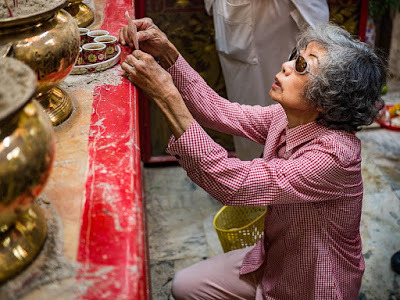 Lighting candles and incense in front of the shrine. 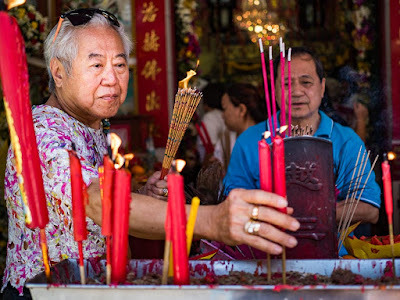 The Mid-Autumn festival is not one of Bangkok's better known Chinese festivals, like Lunar New Year, Vegetarian Fest or Hungry Ghost (it's widely celebrated in Taiwan or China though). On the lunar calender it falls between Hungry Ghost and Vegetarian Festival and most tourists to Bangkok miss it. The holiday is best known as a time for sharing "moon cakes." Chinese bakeries and shops throughout Bangkok, including convenience stores like 7-11, sell the little calorie bombs by the dozen (one small moon cake, a little bigger than a donut, has almost 1,000 calories). 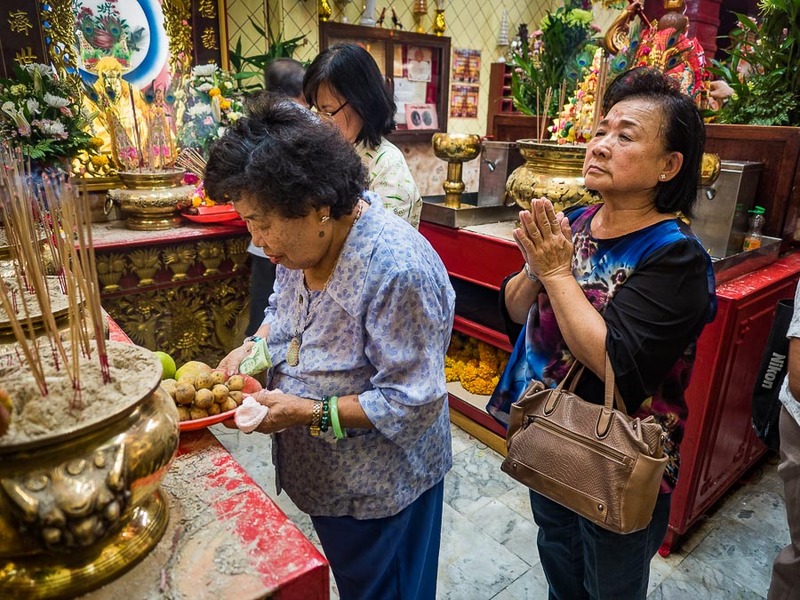 But the religious aspects of the day are largely overlooked outside of the Chinese community. A woman making an offering of cash prays before leaving the money in the shrine. I spent about an hour photographing activities at the shrine. I was finally done in by the smell of the incense. It completely overpowered me and I had to leave. Sometimes the photos find you. Sometimes you find the photos. This time the photos found me.